As the gloomy skies of the rainy season refuse to give way, we would like here to introduce a playful Ōtsu-e painting to lift your spirits - "Oni Playing the Shamisen". Ōtsu-e are a type of folk painting that were produced in and around the city of Ōtsu near Kyoto throughout the Edo period. They were particularly made in large numbers near a central crossroads (oiwake) in the city, and were accordingly also once called oiwake-e, literally "crossroads pictures". As Ōtsu was one of the main stations on the old Tokaido road, these paintings became popular souvenirs for people traveling through the area. With a large bottle of sake and a cup in the foreground, the oni - a type of demon or ogre - seems to be enjoying himself as he plays the shamisen, with his hair flowing wildly. And though it may seem merely like a painting with a festive air, it actually carries a message admonishing human behavior. 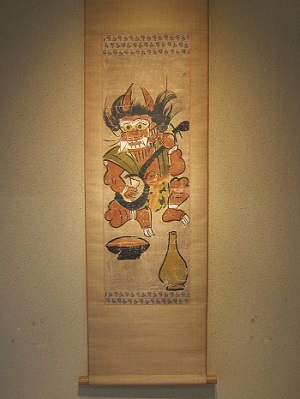 It is said to be a reminder that excessive drink "can put anyone in the demon's hand". We hope that you will take the time to stop by and see this interesting work. With the rainy season well underway, the hydrangeas are in full bloom and things seem to be getting greener and greener by the day. 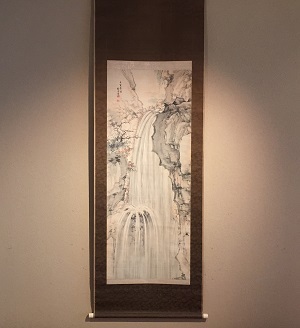 This time we would like to introduce the painting Waterfall, by a late Edo period literati painter from Owari province, Yamamoto Baiitsu (1753 - 1856). Midway, the powerful flow of the waterfall crashes down upon an outwardly jutting rock, causing the water splash forth in such an animated manner that you can almost hear its roar. Though not directly related to the painting at hand, allow us to share an interesting biographical note on its author. One day Yamamoto Ryō was brought to the small temple Banshōji in Nagoya by his mentor and benefactor Kamiya Ten'yū (1710 - 1802). There, he laid his eyes upon an ink plum painting by Wang Mian (1287 - 1359) (see below). 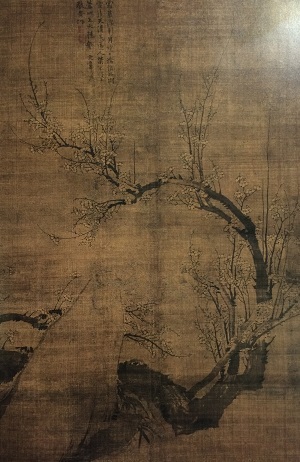 In this painting, small, young branches grow forth from a larger plum branch that curves like a bow, and the white blossoms range from those in full bloom, to buds still tightly closed. 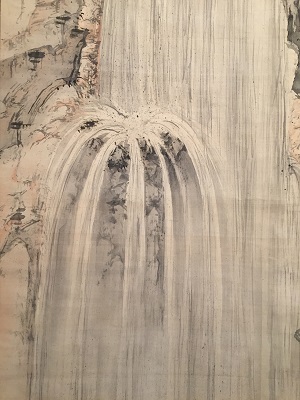 The story goes that Yamamoto Ryō was so taken with this painting that Ten'yū gave him the painterly sobriquet Baiitsu, which means "Excellent Plum". Although the rainy season is upon us, we hope that you will not lose out to the weather and miss the chance to see this painting. We look forward to seeing you all soon. As the summer becomes increasingly humid, the dehumidifiers in London Gallery's Shirokane gallery are hard at work. We hope this finds you all well, now in the midst of the rainy season. 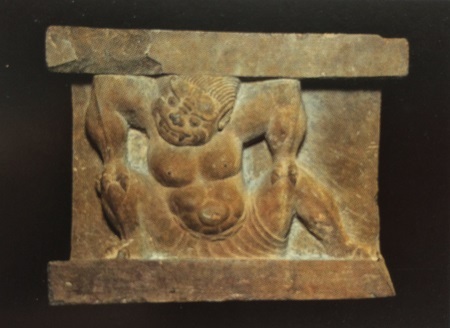 Last time we introduced the crouching monsters from the Xiangtangshan caves now on display in Shirokane, and we would like here to share two of the other examples from American museum collections. 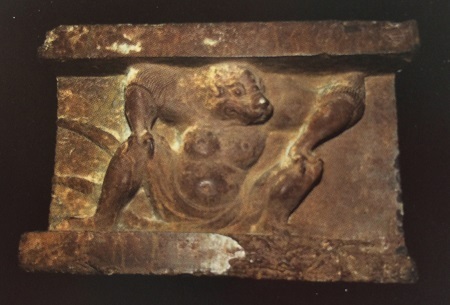 First is that from the Cleveland Museum, which has a dog-like face and what appears to be a tail coming out from its loin cloth. This is the piece in the Sackler Collections, in New York. This is similar to one of the pieces now on display in Shirokane, don't you think? Please come by and see for yourselves!